Performances of circus acts did not start at Vauxhall until well into the 19th century, so almost all the names included in this list post-date 1800. Many of the performers and curiosities came from a circus background, and were well known outside Vauxhall. A number of them adopted stage names to appear more exotic. Bellinck, Juan Tightrope and Slack rope. 'The wonderful Flying or Slack-rope Prodigy, from Indian America, with his sable family. He will fly through a Balloon on fire, surrounded by Fire-works'. 1822. And Young Bellinck, The Infant Devil. Bellinck's 'sable and Surprising Children'. 1822, the families of Longuemare and Bellinck dancing on stilts. Cooke, M. Of the Royal Amphitheatre, Liverpool, he had an 'unrivalled stud of horses, and celebrated troop of equestrians', in 1827. Performers included Mr. Dupont [q.v. ], who drove 12 horses at once, Master Mackintosh, and a Grand Turkish Procession and Entree with twenty horses. 1828. Assisted Farley with Waterloo re-presentations. Cottrell, Mr. Equestrian and strongman, 1842. Coxwell, Henry Balloonist. July 7, 1847, ascended with 60lb. of fireworks suspended below. A storm broke when he was at 4,000 ft., and tore the balloon, but he and his passenger escaped. 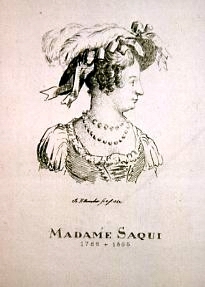 Cuzent, Pauline Equestrienne with Mme. Lejars, 1847. Gale, Mr. George Burcher (b.1794) 1847, night aeronaut [Illus of his firework balloon over the Thames, Minet VI, f.79, 4 Sept, ILN. Portrait of GBG, Minet VI, f.100] Large Poster in Minet vol. of a night ascent with fireworks, August 26, 1847. Killed in a ballooning accident in France, 1850. .
Hillier, Mr & Mrs. With Ducrow's circus but independent equestrains in 1842. Hughes, Mr. Henry 'Hydraulic exhibition of Neptune presenting his crown and trident to Britannia'. Britannia, in Neptune's car, is surrounded by ships of different nations with their flags, many jets d'eau, coloured lights. 1828. See also Henry Hughes under Proprietors and staff. Juba Tap dancer. 1848 (1st. night August 21), with Mr. G.W. Pell and the Ethiopian Serenaders - Mr. T.F. Briggs, Mr. J.H. Everton, Mr. J.W. Valentine, and Mr. M.C. Ludlow. Mortram, Mr. Henry Son of Zachariah jr and Grandson of Vincento de Mortram was active the last few days of the 1849 season (2031 August). In 1852 was, 'firing at Cremorne, with great success' Minet VI, f.115. Fireworks, 1804, 1811, 1812, 1814, 1820, 1822, 1823 (Fridays), 1828. Real name Zachariah Mortram. Native of Agra Exhibiting the miltary exercises of the Sikhs, and other nations of India. Neale, Mr. Joseph Of Jamaica Row, Fireworks. 1798, 1815. Parelli, Mons. Acrobat on the horizontal pole in 1854. Robert, Jean 'The astonishing French Juggler', 1823. 1824 [desc'n of act, Minet V, f.147], 1825. 'The Wonderful Feats of the French Juggler' in 1939. Russelli, Brothers Equestrians. 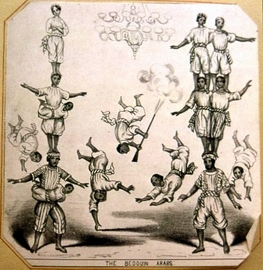 1853, 1854 (3 July'and their Extraordinary Boy on "La Perche"'). Tourniaire Family Equestrian Troupe, 1846. Benoit, Francois, and Louise Tourniaire (Pas de Schwal), Ferdinand; Mons. Agussi (Polichinel Vampyr), Mr. Nicholls (Trampoline Clown), and Madame Klatt (the unrivalled Amazon). Mademoiselle Marie. Messrs. Benedick & Theodore (The Two Spartan Heroes); Mons. Huber (Voltigeur). 1850. In 1851, Benoit Tourniaire was riding master at the gardens. Tyrolese Singers ' who have appeared before her Majesty'. Singing national songs, 1854.